Hawker’s 900XP is the natural evolution of a jet that was initially designed in 1961. Now, you may be thinking that the ’60s is a long time ago. and you’d be right, but the engineers did such a brilliant job that the airplane keeps succeeding. The Hawker 900XP is has staying power. The original design, refined throughout the years has produced one of the most popular mid size cabin business jets ever. Refinements over the years has allowed the Hawker to continue to perform. The series, having been in production since 1963 shows how the British really got his aircraft correct, right off the bat. The 900XP builds on the success of the 850XP by incorporating engines with increased performance, allowing for more range and better hot and high capabilities. The performance increase comes from upgraded versions of Honeywell’s venerable TFE731 engine. More durable materials allow for higher thrust. The 900XP takes advantage of the additional thrust provided by this version to offer better performance numbers as well as increased range. The 900XP incorporates the same winglets as the 850XP, to add increased range. Small differences like this are part of the continual evolution of this Hawker. The Collins Pro Line 21 avionics system is continued on in the 900XP. Four massive screens provide all sorts of information to the crew, to increase situational awareness, as well as reduce pilot workload. Updates like the avionics continue on in the Hawker 750 as well. Updated interior amenities, stunning avionics add to the package that make the 900XP the tip of the evolution of this Hawker line. 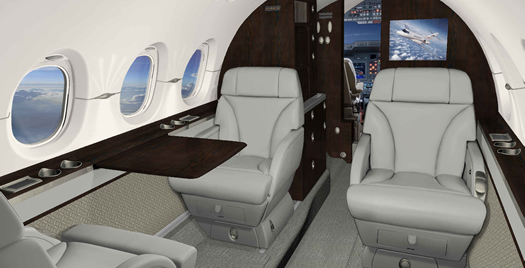 Being one of the most sought after mid size business jets, the 900XP continues to deliver.